The Indre department of Central France is often overlooked by visitors, but it has much to offer. It is often said that the good weather begins once you are south of the Loire, I am sure this is not a guarantee but the sun certainly appears to look favourably upon this region of France. There is much to do in the region but for those wishing to explore further afield the INDRE region is an ideal starting point. You can reach the Atlantic coast, the Gironde and the coast near La Rochelle in under 3hrs providing the possibility of leaving Les Deux Platanes at 08.00 am and arriving at the coast for a coffee in a seaside café overlooking the beach at 10.45hrs. We travel to Chatellion Plage which is a lovely traditional French seaside resort with a very good beach. It is a full day out but since the roads are not busy like the UK the driving is much more pleasurable. See our BLOG for details. In our BLOG we have an article about the Puy Du Fou, again it's a similar distance as the seaside but a unique experience and well worth a visit for all members of the family. Look at our BLOG for pictures and details. Tickets can be booked on line at a special price. How about a trip to Paris on the TGV? You can catch the TGV (very fast train) from Tours (50 minutes north via car) and be in Paris within an hour (tickets booked in advance from 20€). Within 30 minutes: Wine tasting with lunch: Day could include a morning visit to a vigneron & wine tasting followed by lunch with wine at a small local café followed by a second visit & wine tasting. Leave mid-morning return about 4pm. We can provide a route and other details. Water and wildlife: A morning drive through the Brenne Regional Park. Talk in English from wild life warden followed by lunch at the Maison Du Park. Try your hand at bird watching from a secret hide but remember your binoculars. Wild Life: Visit to Zoo Parc de Beauval one of the premier breeding zoos in France. All guests who have been report it's one of the best Zoos they have ever seen. 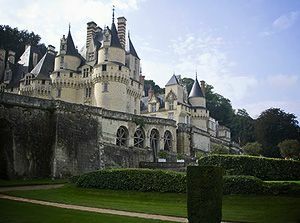 Grand Châteaux of the Loire: A morning visit to the famous Chateaux and gardens of Chenonceaux. Lunch in Amboise, sightseeing and/or visit to Amboise chateaux or Leonardo Da Vinci house. Did you realise Leonardo Da Vinci lived in Amboise (Le Clos Luce)? You can see many of his inventions brought to life. Within an hour: Richard the Lion Heart: visit the town of Chinon famous for its wine and history. 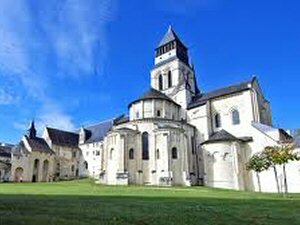 Stay for lunch then visit the Abbey of Fontevreau, (Henry II, Eleanor of Aquitaine and Richard are interned here) returning via Richelieu historic town. Click here for further information about this visit. Cruise through the Creuse: Drive south to Le Blanc then on through part of the historic and beautiful Creuse valley with a stop for lunch in one of the many cafes and restaurants overlooking the magestic river valley. Day in the forests: We have a route available taking you through Sologne visiting the Le château de Moulin, "Pearl of the Sologne" known as the Strawberry Châteaux. Sleeping Beauty's Castle: The Chateau d’Ussé was built during the 15th century. It had many owners, one of whom was Charles Perrault (who is said to have been inspired by the Chateau when he wrote he famously authored “Sleeping Beauty”). Other famous writers Voltaire and Chateaubriand have also lived there. 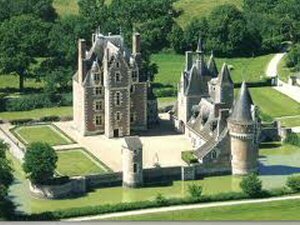 Click here to see a photo-montage of for The Chateau d’Ussé on YouTube, uploaded by AgelessGlobeTravels.